Take the stress out of finding nurse home care for your disabled child by getting our resource guide. ?What do you do if you think someone you know was harmed by medical malpractice? ?What can I do to make my hospital stay safer? What can I do to protect myself from medical malpractice injuries? ?What is brachial plexus? What is Erb's Palsy? Caring for a disabled child is a full time, 24/7 job and sometimes you need extra help. You may need to get a nurse for home care to assist you and your family. Getting the right help for your child is stressful. That's why we wrote our resource guide. We wanted to take some of the stress off of parents by giving them some vital information in the D.C., Maryland and Virginia area to help parents and children with disabilities. Getting the right care for your child depends on the specific needs of your child. How do you make sure your child is getting the right level of nursing care at home? Start by talking to your child's doctor make sure you're asking all the right questions. Come to the appointment with a list of all your questions and concerns and any changes your child has. Ask about the different types of medication your child has to take and their interactions, the therapies he is getting and what would help him be more mobile, like simple massages or stretching exercises. Being well informed about the treatments and therapies your child receives will help you get a better understanding on the type of nurse home care you will need. When looking for in-home care the first place to look in through the state. If your child receives Social Security Benefits, you should be referred to health care services for your child. Medicaid is based on the income of your family and those who have been receiving Social Security benefits for at least two years can qualify for Medicare. Through both Medicaid and Medicare, a parent can find the right in-home care for your child. Sadly, you probably can't rely on Medicaid to provide all of the nursing care a severely disabled child with cerebral palsy or similar medical condition needs. If your family or adult child does not qualify for Medicaid, they can apply for Children's Health Insurance Program, and go through them to help find in-home care. 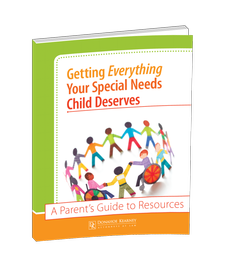 To help find the right in-home care for your child, order your FREE copy of our resource guide, Getting Everything Your Special Needs Child Deserves. We have divided the different types of individualized care and services based on whether you live in D.C., Maryland or Virginia. Every state is different when it comes to getting health care for your child. Why stress any further when we have it written out for you? To obtain your copy of our resource guide send us an email at [email protected] or give us a call at (202) 393-3320.